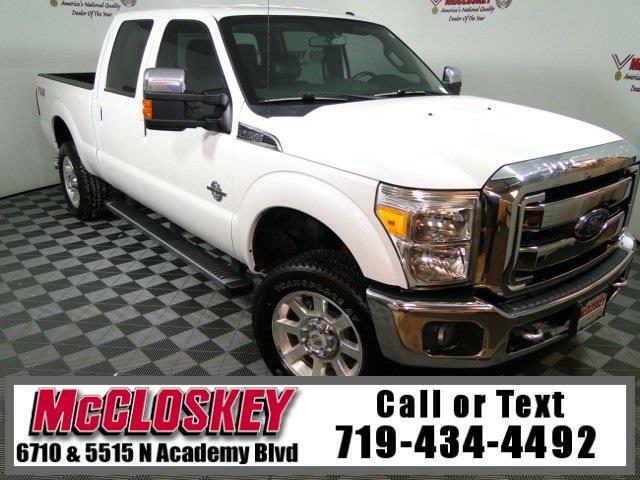 Pristine 2014 Ford F-350SD Lariat 4x4 Crew Cab with Navigation System, Heated and Cooled Seats, FX4 Package, Keyless Entry, Trailer Brake, AUX and USB Connection, and Chrome Package! The Lariat trim cranks up the luxury with 18-inch wheels, foglights, power telescoping mirrors, body-color door handles, rear parking sensors, remote start, a power-sliding rear window with defrost, dual-zone automatic climate control and leather upholstery. Also standard are a 4.2-inch color trip computer, wood-tone interior trim, an auto-dimming rearview mirror, power-adjustable pedals, leather upholstery, eight-way power-adjustable front seats (with power lumbar adjustment), a middle front seat that converts into a center console, the MyFord Touch infotainment system with an 8-inch touchscreen, upgraded Sync functionality, a rearview camera, a 110-volt power outlet and an eight-speaker audio system with satellite radio. Note that the crew cab gets a premium Sony audio system. Optional is a turbocharged 6.7-liter diesel V8 engine that produces 400 hp and 800 lb-ft of torque. Maximum towing capacity without a fifth wheel is 18,500 pounds.